120 Batley fans will wear pink shirts as they walk to Wembley. BATLEY BULLDOGS have revealed plans that they hope will see 120 fans take part in a charity walk to Wembley Stadium for the Challenge Cup final on August 26. This season marks 20 years since chairman Kevin Nicholas and Andy Winner took over at the club, along with the late Batley stalwart Ron Earnshaw. It is also the 120th anniversary of Batley winning the first Challenge Cup. 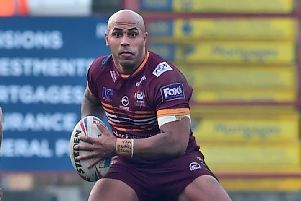 Batley need 120 people to participate in a 10k sponsored walk from London Broncos’ ground to Wembley ahead of the cup final. The cost is £20 (child or adult) to participate, which includes day return coach travel from Batley to London, a match ticket for the Challenge Cup Final and a pink t-shirt. Fans are also asked to guarantee a minimum £20 sponsorship. The group will walk in pink t-shirts to reflect the breast cancer research fundraising cause. The 120-strong group will sit together at Wembley and letters on the shirts will spell out ‘Batley 10 St Helens 3, 1897 Final’.